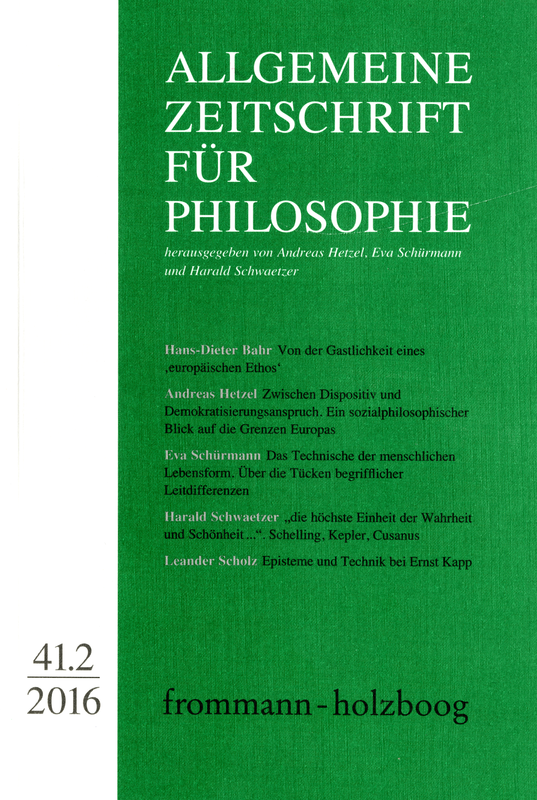 With contributions by Hans-Dieter Bahr, Anna Berres, Andreas Hetzel, Corinna Lagemann, Leander Scholz, Eva Schürmann and Harald Schwaetzer. The paper starts by examining the vision of an open Europe that no longer behaves as a mere lord and host, but defines itself as a guest of its guests in order to renew itself in encountering with these guests (1). What stories lie behind the name ›Europe‹ and how did the emblem of its mythical self-description came into being, which coalesced in the image of the inhospitality of a cavalier: falling in love with the Phoenician princess Europa, Zeus kidnapped her in the shape of a white bull, brought her to Crete, where he impregnated and left her. Their son Minos is considered to be the founder of the first civilization of the West. What kinds of bull gods and bull cults murmur in the background of this image (2)? How can the meta-ethical essence of hospitality be related to the ethics of hospitable rights, guest-friendship and hostility (3)? Will Europe be able to break away from his inhospitable, bull-like self-image (4)? This paper outlines a social philosophy of borders with a focus on border related violence. Starting with the current refugee crisis, I look first at walls and seas as places where the return of borders can be most dramatically experienced. A second section discusses and criticizes theories that attempt to describe borders only as institutions and dispositives. This investigation leads to a discussion of the normative implications of current border policies, particularly to the possibility of their democratization. Finally, based on current approaches, I argue for a notion of unconditional community and hospitality, which I understand as transformations of an older natural law tradition. Following this tradition I support an interpretation of today’s migratory movements as an expression of ›presentist democracy‹ and of a critical questioning of a postcolonial world order. The difference between the technical and the living is increasingly difficult to define the more it is undermined in actual practice. By now, the interconnectedness between natural and technical conditions of the human form of life is not a matter of ontologically isolated spheres and cannot be described anymore by using hypostatizing vocabulary. Referring to classical authors of philosophy of technology the paper portrays the principal ambivalences of the use of technics. These should be carefully scrutinized so as to leave the original imago of a technical-free-zone behind and concentrate on the dynamics between the natural and the artificial instead. Nevertheless, central conceptual distinctions cannot be dismissed altogether. The question whether Nicholas of Cusa had any influence on Schelling at all, is usually debated with regard to Giordano Bruno. The paper shows that there is also another possible trait of reception. We will find strong evidence that Johannes Kepler intermediates between both philosophers. Therefore five modi cogitandi are systematically analyzed as points of convergence between Cusa and Schelling: 1. docta ignorantia, 2. coincidentia oppositorum, 3. visio intellectualis, 4. coniectura, 5. the literary form of a ›philosophy of mysteries‹. This article outlines the philosophy of technology by Ernst Kapp by contrasting his anthropological approach with the concept of humans as deficient biological beings with reduced instincts. In particular focus is Kapp’s epistemological perspective on the problem of technology in distinction to a practical orientation. From this point of view technical inventions are not only ways of solving problems, but enable knowledge of nature. By renewing the ancient philosophy of nature Kapp promotes a philosophical tradition beyond the modern opposition of nature and culture. Corinna Lagemann: Heidegger und das Paradox des Subjekts.